The Welcome Basket will include a variety of local products for you to enjoy during your stay. Nestled in the heart of historic Kitsilano on the quiet tree-lined of West 6th Avenue, you will find the heritage property of Kitsilano Suites designed in the Arts and Crafts style. 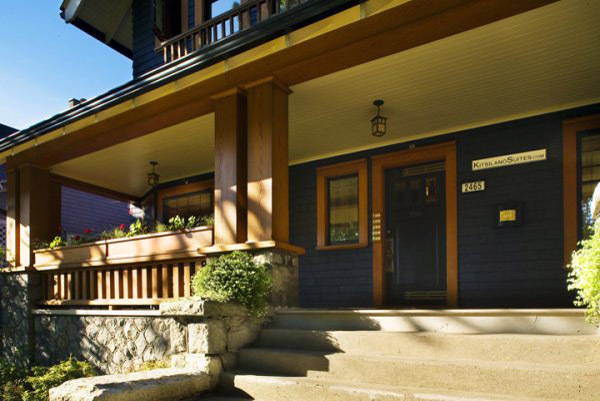 Our character house offers fully furnished suites that providing guests with comfortable self-contained accommodations, finished to exacting standards to ensure a comfortable stay with all the amenities of a home away from home. Originally built in 1912 as a single family dwelling, and converted into veterans housing apartments in 1946, the building has been restored to its original splendour. Completely updated mechanical systems include new electrical, plumbing, fire sprinklers, fiber optic communications, and the latest in sound separation technology. Featuring custom gourmet kitchens with granite counter tops, luxury sleep sets with high quality bedding & linens to ensure a restful sleep, and full bathrooms with claw foot tubs/showers and heritage bathroom fixtures imported from Italy. 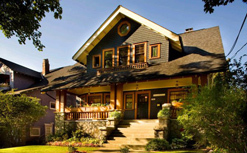 Original wainscoting woodwork, hardwood flooring and stained glass windows throughout. Each suite features a dedicated outdoor porch or balcony area with bistro seating sets for enjoying the landscaped gardens and tranquil street scape. We invite you to review our web site to learn more about our premium Kitsilano location and our first class accommodations. We are happy to answer your questions and offer assistance in any way we can. Including high speed fiber optic wireless internet service at no additional cost to our guests. Each suite features dedicated telephone service with voicemail systems. HDTV's featuring a great selection of channels to choose from, including Netflix. Each suite has its own independent electrical service to avoid any power interruption or electrical overload, with self-governing heating systems. Gas fired on-demand water heaters insure constant hot water. The latest sound separation technologies have been incorporated throughout the building to reduce any sound transmission between suites. Restored and refinished hard wood floors. High quality wool carpets in hallway common areas. Repaired and refinished wainscot woodwork and wood trim. Wood burning brick fireplaces restored to their original condition. Heritage style fir suite entree doors built to meet fire code requirements. Original refinished fir wood windows featuring custom built storm windows. 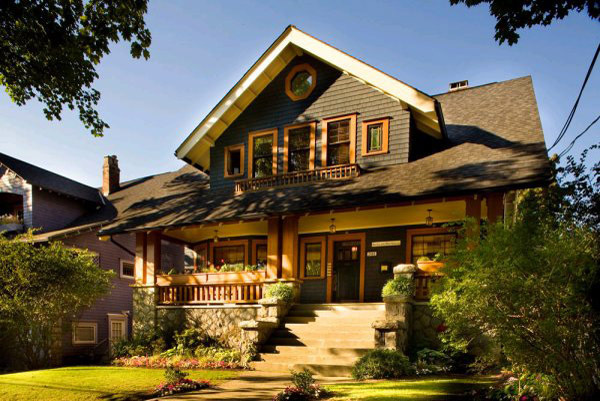 Completely restored original front porch with private back balcony. Claw foot bath tubs, restored and refinished to their original condition. Custom built kitchen cabinets with granite counter tops. Modern appliances in all suites. Landscaped gardens with private back yard and sun patio with lounge chairs. New electrical system with separate electric service to each suite. New plumbing throughout the entire building. Completely insulated to meet or exceed Building Code requirements. All new wall board finished with high quality paints. Multiple sound separation systems between suites. Engineered fire sprinkler protection system. Laundry facilities with industrial quality coin operated washer and dryer. For additional information about each Suite, please review the Accommodation area of our web site. You will find a brief summary of each suite and a "More Information" tab for additional services and amenities information.